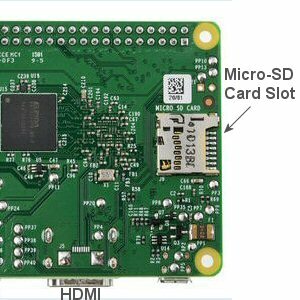 The Raspberry Pi ® is a very affordable, credit-card sized SBC (Single Board Computer). It is a very capable device designed for computer exploration, as discussed in the previous article. 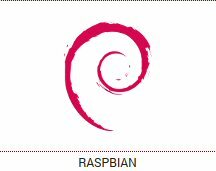 This article will discuss the process of downloading and installing the officially supported Raspbian operating system from scratch onto an empty Micro SD card, using the second generation product (Raspberry Pi 2 Model B) and the NOOBS installer. 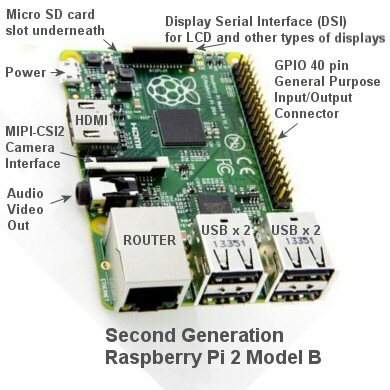 The Pi 2 Model B can function as a home automation controller just as well as other dedicated units such as Vera®, Wink®, Homeseer®, SmartThings®, etc. It also functions very nicely as a general purpose computer. Configured as a home automation hub, it does not depend on the cloud for operation, something we feel is a very important consideration when setting up an automated system. It will control your home and greenhouse with or without an internet connection. The kits also typically include a 'wall wart' type of 5v AC/DC power supply; this can be important because the Pi is powered via a micro USB connector (not a mini USB connector). If you don't have a tablet or other device with the same type of power supply, you'll want to include one of these in your purchase. The Pi 2 B has a slot on the underside of the board that accepts a Micro-SD card that is about the size of a thumbnail. This tiny little component can actually be thought of as a replaceable solid state hard drive for the Pi that can be swapped out with other Micro-SD cards, containing different operating systems. They hold quite a lot of memory, and a 64 GB unit will give you plenty of room for the operating system, programs and data. Here it is shown as inserted into the larger adapter that allows you to use a regular laptop to recognize it as another drive. Micro-SD cards can be slow, so you may want to hunt for one that conforms to the UHS-II spec, which means they share the same performances figures as fully grown SD cards: currently 240MBps write speed and 260MBps read. NOOBS is an acronym for New Out Of Box Software, and it is essentially a compressed zip file that will automatically install the operating system that you select. We used it to install the Raspbian operating system, which is the officially supported operating system for the Pi. There are plenty of other options for an OS, but we felt this would be the safest one to start with. The NOOBS file is quite large and the download servers may be busy (i.e. slow), so allow yourself some time to download the file (it took around 10 minutes for us on a fast broadband connection). We used one of our Dell laptops with Windows 7 to download and expand the NOOBS package, then we copied the unzipped files to the Micro-SD card that was seen as drive F: in our Windows 7 file manager. There are a few different ways to do this, as seen on the download page, but we chose the ZIP download. Once you have finished downloading and unzipping the NOOBS installer, you can copy it to your new Micro-SD card. The new card is probably pre-formatted, and you can test this by copying a single file to it. 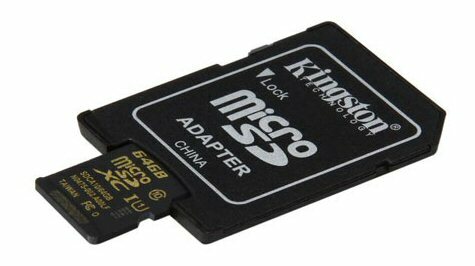 If it won't copy, you may have an unformatted Micro-SD card and you'll have to format it before you can proceed. Once the NOOBS installer is copied to your Micro-SD card, you can insert it into the slot underneath the board. It will only go in one way, and you should not force it. It has a toggle latch that will hold it in place, so just slide it in until you see it latch in place. To remove it, just push it in slightly and it will release the latch and the spring loaded mechanism will eject it. At this point you are very close to that magic moment where you can fire up this puppy. We had previously purchased a wireless keyboard/mouse pair that uses a USB dongle, and we plugged that in (turns out it worked perfectly). You can also use wired versions; this Pi has 4 USB ports, so no problem using 2 for those components. We later found that we had to select the standard US keyboard (in preferences) to make the @ symbol appear properly when typing an email address. And boom, it booted up, the NOOBS install process started, and the very user friendly process began. We had to select the Raspbian option with the mouse, and it launched straight into the install procedure. This takes a while, and there are message screens with general information about the Pi capabilities that provide useful information while a progress bar is displayed. As I mentioned previously, we were very pleasantly surprised that we immediately had access to applications such as browser, email, office suite, programming tools, text editor and numerous other programs. 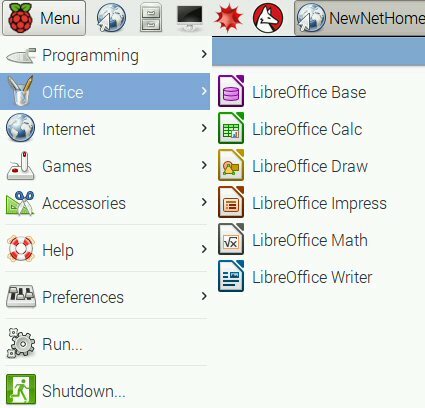 When you click the Raspberry Icon the main menu drops down, and there are subsequent flyout menus from that; in this image we're showing the Libre Office Suite (there's a lot of capability there!). This Pi is a very suitable replacement for any laptop, just as a general purpose computer. If you don't own a computer, the Pi would be a very effective entry point into the world of computing, and it really is amazing to see what a credit card size computer can do these days. 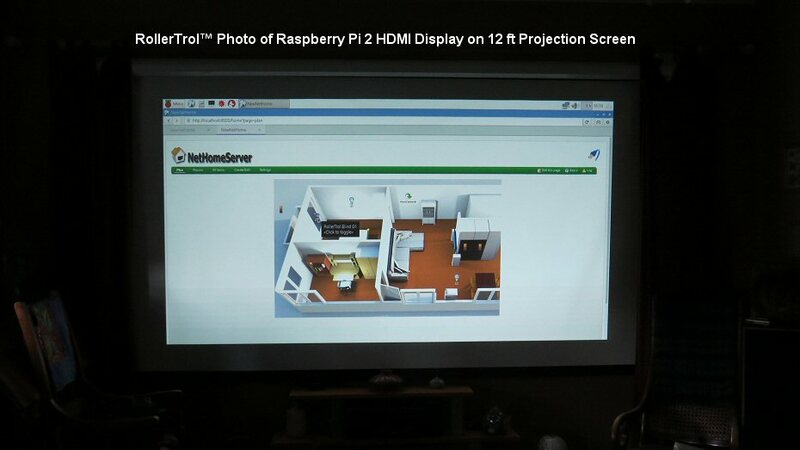 Our primary interest was in applying the Pi as a home automation controller, so we didn't explore for long and quickly moved on to Stefan's OpenNetHome automation software. This software sets the Pi up as a web server on your local network, and you can access it with any browser on any device in your home, or from anywhere on the Internet (if you decide you want remote capability). Please see Part 3 for that implementation. Once you have it installed, right-click on the top border bar to activate the bookmarks bar to make bookmarking easy, and the menu bar if you want direct access to the menu system.